I planned to do my marathon long run today. With all the fuss about the weather forecast for this weekend I thought 9 miles plus on Saturday or Sunday might be difficult so I sensibly decided get it in the bag today while doing some nifty work, housework and ironing pile avoidance. However I failed to take into account the 200 squats I did yesterday at BMF. I had quite achy legs and glutes this morning but assumed the run would help loosen my muscles up and help get over the DOMS. I set off mid morning, starting very slowly as I tried to warm up and loosen my legs. However it was so cold that my legs never warmed up and my muscles got stiffer and more painful. 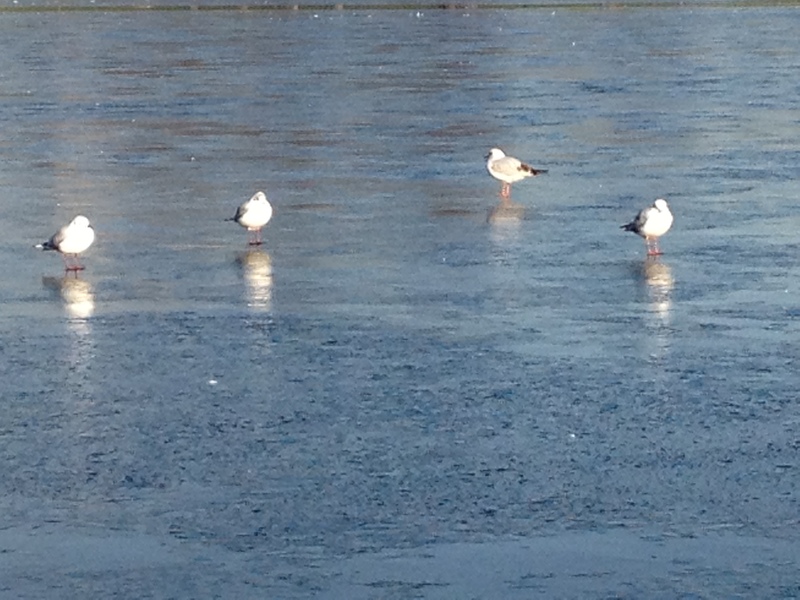 I tried to run through it thinking that by 3 or 4 miles I would feel fine but when I stopped to crouch down and take a photo of birds on the frozen Serpentine I had trouble getting up again! At this stage I abandoned my 10 mile plans and waddled home. For those of you who have asked, I’m following The Runners World improvers marathon training plan to train for the Milton Keynes Marathon. (RW’s January 2013 issue.) For the first 3 weeks during Janathon I am making sure that in running every day I at least cover the plan. I will then follow it closely, give or take. It’s a 16 week plan, assuming base mileage of 25-30 per week and starts at 25 miles a week building up to 50 miles at peak. I also find the Runners World online smart coach very useful for giving target paces for speed intervals and long runs based on past race times or target marathon time. Janathon day 17. 7.65 miles at long slow run pace (less some)! Categories: Janathon, running | Tags: Hyde Park, Janathon, long run, marathon training, Running | Permalink. Me too. I ache today. Me too was going to do their long run today. Me too waddled home! Where did you find the Runners World online coach? The RW Smart Coach looks great, thanks for the tip! Lovely pic. Must look up the Runner`s World plan. I`m partial to Hal Higdon myself but wouldn`t mind some extra tips.